Kahn Fotuali’i has recovered from a shoulder problem and will be on the bench for Saints’ crucial Champions Cup clash with Racing Metro on Saturday (ko 3.15pm). The Samoan scrum-half has been sidelined since sustaining the injury in the act of scoring a try in the win against Harlequins at Twickenham on December 27. Saints have made three changes to the side which won 20-9 at Ospreys last weekend, with Alex Corbisiero, Salesi Ma’afu and James Wilson coming in. Corbisiero replaces Alex Waller, Ma’afu, back after serving a one-week ban, is in for Gareth Denman, while Wilson fills the void left by Ben Foden, who is out for the season with a knee injury. Tom Stephenson takes Wilson’s place on the bench, with Teimana Harrison also among the replacements. Meanwhile, former Saints favourites Brian Mujati and Juandre Kruger are among the Racing replacements. Jonny Sexton misses out with a head injury, while Brice Dulin and Alexandre Dumoulin are also sidelined. But Racing can call on Wales stars Jamie Roberts, who starts, and Mike Phillips, who will be on the bench. 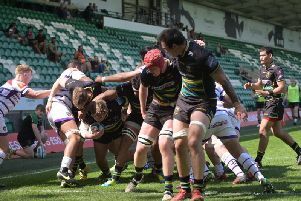 Saints: Wilson; K Pisi, G Pisi, Burrell, North; Myler, Dickson; Corbisiero, Hartley (c), Ma’afu; Dickinson, Day; Wood, Clark, Manoa. Replacements: Haywood, A Waller, Denman, Dowson, Harrison, Fotuali’i, Stephenson, Elliott. Racing Metro: Lapeyre; Imhoff, Chavancy, Roberts, Thomas; 10. Dambielle, Machenaud; Ben Arous, Szarzewski (c), Ducalcon; Charteris, van der Merwe; Lauret, Le Roux, Claassen. Replacements: Lacombe, Brugnaut, Mujati, Kruger, Gerondeau, Phillips, Goosen, Chat.